Cyril was born on April 17th, 1897 at about the time the family is believed to have moved to Eton Wick from Tidworth in Hampshire. In September 1910 he left the Eton Porny School to complete his education at the Windsor County Boys' School. During his school years he frequently helped on his father's farm until April 1914 when he left school to become a banker's clerk for Barclays at Southall. 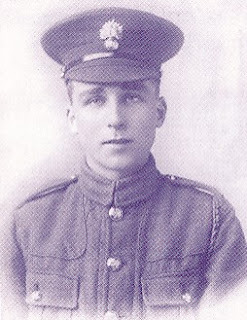 He joined the Army in April 1916 when he was just 19 years old and served with The Honourable Artillery Company. He was a very likeable lad and probably more outgoing than his older brother, Douglas. 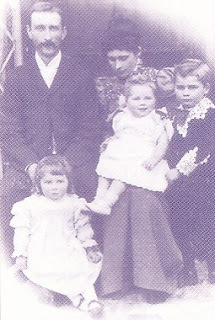 Eight months before Cyril enlisted, his 23-year-old brother was killed in the Gallipoli offensive. It is not known whether this loss influenced his own decision to join the army, but it is not difficult to understand the apprehension of his parents as their one remaining son went off to war. As a boy he often called on Mrs Roll Bond of I Palmer Place and jokingly asked for titbits from her larder. In return he would take her a pail of skimmed milk and said it would only be given to the animals if she did not use it. Mrs Bond was very fond of young Cyril and she is said to have named a son after him. When Cyril had completed seven months of military training he was posted to the Western Front and in the late summer of 1917 he was serving in the Ypres Salient, Belgium. He was wounded on October 7th and suffered Trench Fever, but was soon back in the front line. It was late Autumn and the battle had raged for three months with the aim of breaking out from the Salient and capturing the distant high ground known as the Passchendaele Ridge. Intense shelling had destroyed all the network of drainage ditches and the heavy rains made the terrain a glutinous, oozing quagmire. November 10th the ridge was finally taken at the appalling price of an estimated 250,000 casualties of whom 42,000 were never to be recovered. Cyril was killed here at Gheluvelt on October 26th, 1917, while trying to rescue a wounded comrade. Unlike his brother, he has a grave and is buried in the nearby massive military cemetery known as Tyne Cot. 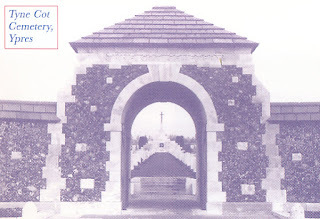 The cemetery is situated five miles northeast of Ypres and it contains 11,000 graves. Memorial walls there name nearly 35,000 other soldiers, who have no known graves. This total of approximately 46,000 British men were all killed in the Ypres Salient between August 1917 and the Armistice of November 1918. Cyril's grave is number 21; Row C; plot 55. 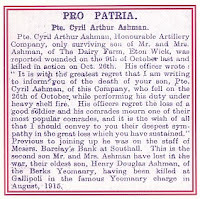 Mr and Mrs Ashman received a letter from their son's commanding officer which read: It is with the greatest regret that I am writing to inform you of the death of your son, Private Cyril Ashman of this Company, who fell on the 26th October while performing his duty under heavy shell fire. His officers regret the loss of a good soldier and his comrades mourn one of their most popular comrades, and it is the wish of all that I should convey to you their deepest sympathy in the great loss which you have sustained.In little more than two years, Edwin and Alice Ashman had lost both their sons in the Great War. They left Eton Wick and the farm to live in Lansdowne Avenue, Slough. Their one remaining child was Dorothy. She lived until 1956 and was buried in the Eton Wick Churchyard. Her grave headstone bears the names of her two lost brothers along with her own. Cyril's name is the second on the village memorial. He is also commemorated on the Eton Church Gates and on his old school memorial in Windsor. Cyril was single and 20 years of age. 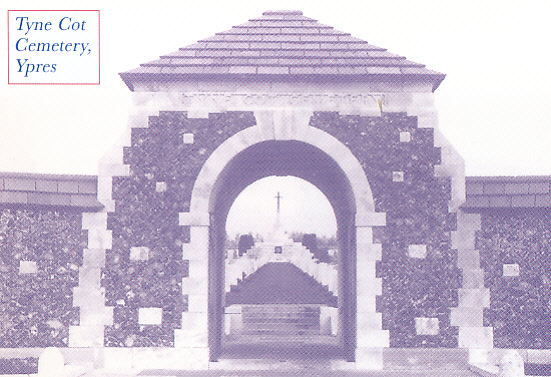 Cyril Ashman: The Commonwealth War Graves Commission page. 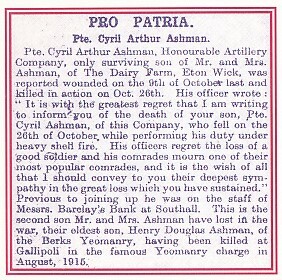 of Private Cyril Ashman as 28th October 1917. Cyril Ashman: The For King & Country page. Ernest Brown: There is no information about him on Lives of the First World War as yet. Cyril Ashman is also recorded in the Barclays Bank WW1 Roll of Honour. 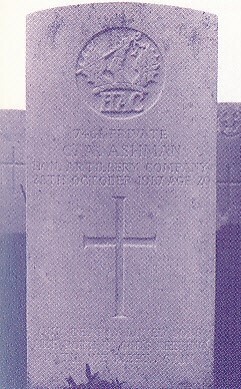 Private Ashman was one of 645 Barclays employees who died in the service of the country during the First World War.